Wise, gentle, and generous, courageous and unselfish, tenderly devoted to the happiness of others, giving praise openly, doing good secretly, gracious and lovely in act and thought. Amy Hewitt. Courtesy of the NY Historical Society. 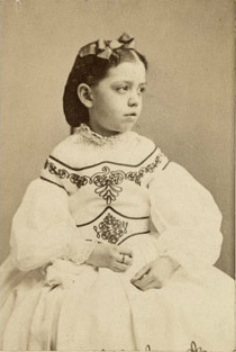 Amelia Bowman Hewitt was the oldest of Abram's six children, born on February 28, 1856. It is said that she inherited many of her parents' and grandparents' finest characteristics: an engaging personality, gentleness, kindness, and an interest in anything that could benefit others. Amy possessed the courtesy and simplicity of manner which came directly from the heart. As a child, Amy showed such maturity beyond her years that Mrs. Hewitt often had her act as her assistant when entertaining guests, planning parties, and even in helping to raise her younger brothers and sisters. Her nurturing character led her to live close to her parents throughout her life in order to help care for them during their old age. Of all his grandchildren, Peter Cooper was closest to Amy. He once said that she was "an excellent girl of humble disposition." Amy especially endeared herself to her grandfather by her unusual intelligence and her marked desire to understand the thoughts and ideas of her elders. Therefore, as soon as she was old enough, he made her his constant companion, frequently driving her himself down to the Cooper Union on a daily basis. Courtesy of the Cooper-Hewitt National Design Museum. Later, although still a very young girl, she accompanied him to the Free Lectures, held every Saturday evening in the Big Hall of the Cooper Union. Afterwards, he would discuss these lectures with her, even when some of the scientific subjects must have seemed far too complicated and dull for a girl of her age. Those were the days when very few of even the most popular lectures were illustrated by magi-lantern slides thrown upon a screen. More often than not, the lecturers only emphasized their points on a simple blackboard. Amy Hewitt and James Green. Courtesy of Cooper Union. The ceremony took place at 1 o'clock, and was performed by the Rev. Thomas M. Peters, of this city. The bride was given away by her father. She wore a white brocaded silk dress, which was so heavily covered with the brocade that the silk was scarcely visible, with a train and a veil of tulle edged with rare and costly lace. Her ornaments were diamonds, among which a star of five rays shone resplendent. A bouquet of roses completed her toilet. The bridesmaids were the two sisters of the bride and Misses Clare and Leila Bryce. They were handsome gowns with pink ribbons and sashes, and carried pink roses. The ushers were the Messrs. Griswold, Hitchcock, Peters, Lorillard. 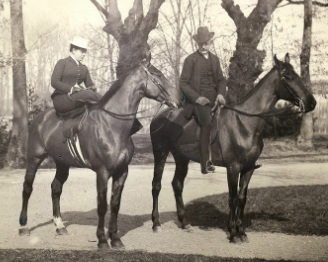 Edward Cooper, and Peter Cooper Hewitt. Mr. Allen Rice was the bride-groom's best man. Ringwood residence of Amy & James Green. Courtesy of Cooper Union. After the wedding was over and their guests had left Ringwood Manor, the Hewitts allowed the employees of the estate to enter the house and greet Amy and her new husband. The Hewitts also gave each worker a slice of the wedding cake. Mr. and Mrs. Hewitt presented Amy and James a summer estate directly across from Ringwood Manor as their wedding gift. The granite Victorian mansion had been built by Edmund Miller, a business associate of Hewitt's. Upon his death, the Hewitt family acquired the structure and surrounding property. This became the new couple's summer residence. Amy and James had two children, Norvin Hewitt Green (1893-1955) and Eleanor Margaret Green (1895-1966). These children also experienced Ringwood. After spending their summers at their family's home and Ringwood Manor, they grew to love the area and became involved with preserving the open spaces and historic structures here. Please see their pages for more information. The Hewitt sisters. Courtesy of Cooper-Hewitt National Design Museum. As a child, Amy had developed a love for Cooper Union. Influenced by her grandfather, Amy shared many of Peter Cooper's hopes and aims for Cooper Union. Like the rest of her family, she was greatly committed to helping others by exposing them to education and the arts. 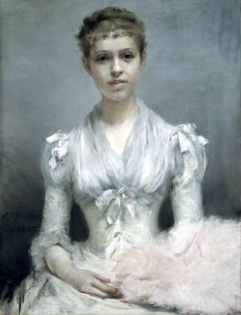 Amy devoted much of her time to the work of the Ladies' Advisory Council of the Woman's Art School and of the School for Typewriting and Stenography of the Cooper Union, of which she was the permanent secretary. 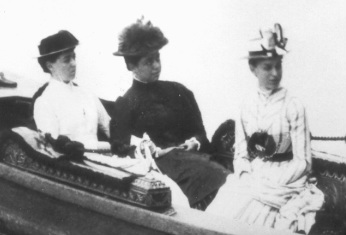 Additionally, she was involved with her two sisters in creating the Cooper-Hewitt National Design Museum. No personal or monetary sacrifice was too great for her when it came to the financial support of Cooper Union. She took advantage of whatever opportunities she could to benefit the educational institution and improve the programs it offered to the public. 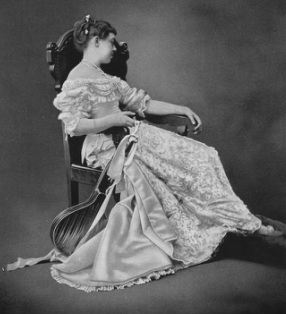 At the time of her death on May 25, 1922, she had donated a vast majority of her fortune.